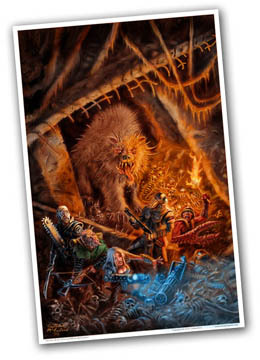 This news archive consists of all the front page text and imagery for The Mutant Epoch RPG, supplements, reviews, links, and related media. 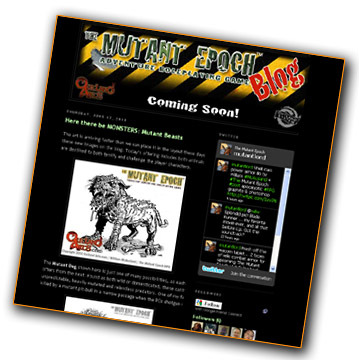 The all new The Mutant Epoch forum is here! New to The Mutant Epoch? Well, previously, only Society of Excavator members could get into our forums as they were a member's only deal. That's all changed. 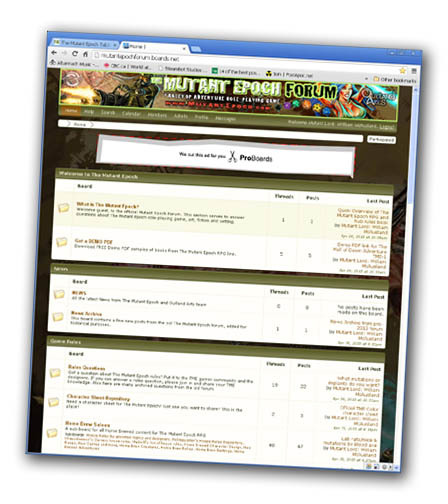 All the old forum posts have been copy-pasted over to an all new forum, reorganized, enhanced and open to all. Of course, there is a password protected SOE only board where, as an incentive to get SOE members to enlist, we've made a forum only, free beast ready for you to download! Members can get the Muto-Harpy PDF exclusively at the new forum's Society of Excavators Members Only Area. The password to the private area of the forum is easy to remember. Its the same as what you used to sign in to the members area at this website! Not a member yet? 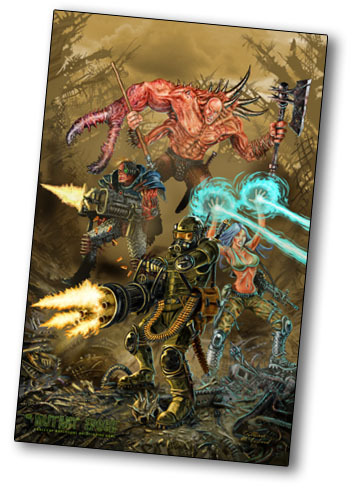 Bought a copy of the Mutant Epoch hub rules? Then learn more about The Society of Excavator's here. 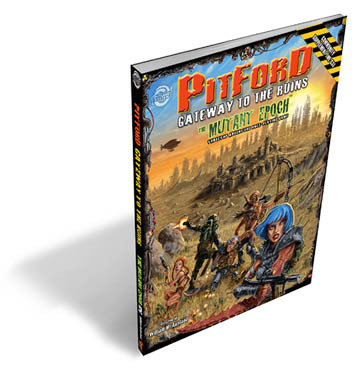 We've updated the front end of the site and streamlined and organized the products page, added art for the upcoming Pitford Gateway to the Ruins book, and much more. We've released all six issues of Excavator Monthly magazine and announced that for the time being we won't be doing a monthly publication but instead aiming at a larger quarterly periodical called Excavator Quarterly. The place to really get the news on The Mutant Epoch is our blog, although our twitter feed is also excellent for updates. This page should really be more of an archive of home page content. 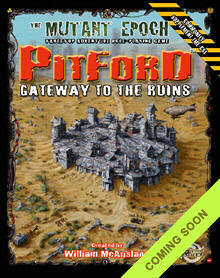 Presently we are on the eve of releasing our third large book, Pitford: Gateway to the Ruins. This 188 page community setting book is going to be at least 188 pages and contain around 11 illustrations and over a dozen maps. We are aiming for a mid May 2012 release of this book in both PDF and hard copy. Curious? You can learn more here. Stay informed on The Mutant Epoch release by joining our newsletter mailing list. 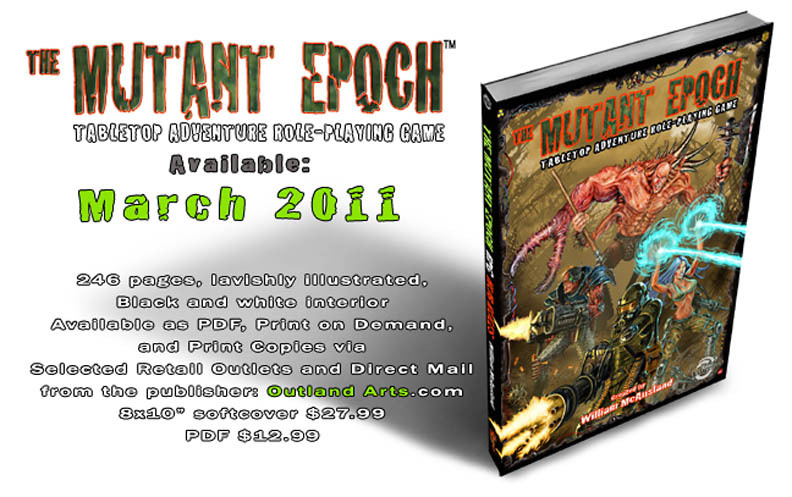 The Mutant Epoch available in March! The third round of proofs are on their way to the Studio, the content rich official web site all but done, the free content PDFs loaded and the forum's being tweaked. This is it. The TME Hub rules book will be available at Createspace, Amazon.com, Drive Thru RPG, RPGnow as print books, as well as PDF versions through your games now, and the previously mentioned outlets. We will also order a limited quantity for the two game stores here in Kamloops, as well as several to be mailed to reviewers and several international customers who want signed copies direct from us. We will be posting much more frequently once the launch has happened. The Mutant Epoch Hub Rules book is done. We are edging very close to a firm, fixed release date, and are just finishing off the last of the free online content, dealing with our web design guys, setting up the password protected Society of Excavators members area and forum... and getting together some art for the many PDFs that users can download for free. Excited is no word for it. A final proof copy was sent from Lulu.com last week. Just need to give it a quick look through and assure ourselves that he quality is good ad then as soon as the new site is up and working, we will releases within days. It is looking like the last week of January 2011 is the releases date. 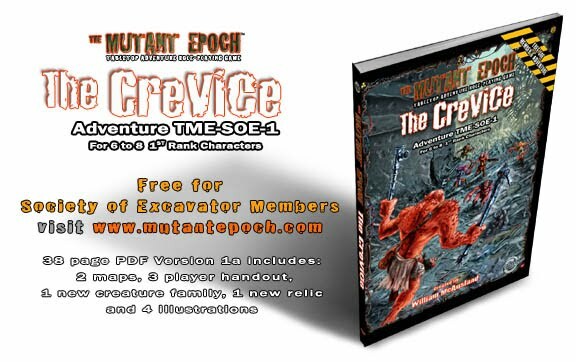 The above image shows a mock up of the free adventure called The Crevice, or at least the earliest online version of it as we plan to update it with more art once we have a free week. We have been working so hard that we haven't devoted much time to advertising, twitter, blogs, art previews and such. while all these pre-launch promotions are great and highly recommended by marketing people, I'd rather be promoting once I have a product to offer. There will be enough chance to arrange pre-launch hype for other books, as we have several well along in the works including The Mall of Horrors and Pitford: Gateway to the Ruins. Of course, there is the monthly magazine. 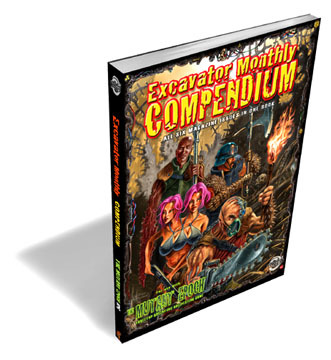 We don't have a set date for when the first of those come out, and would like to get the first three issues loaded and ready for the market before we release the first issue of Excavator Monthly. The covers, articles and much of the art is done for the magazine already, we just need to assemble them and give them each a final edit. Hi Anonymous, and you others who are waiting so patiently! The final edits got turned in and we have about 60 more pages to go through and then it is good to go. I'll order a test print copy via lulu.com to make sure the conversion looks fine, and then make it available as both print on demand and PDF versions at once. We'll get a shipment of hard copies sent to the office and deliver these to the local game shops and book stores, and commence the mail order for those in Europe and elsewhere who have been waiting for their copy. The only issue now, besides inserting the final edits is working with our server host to get the Society of Excavators password protected area of web site up, and the phpBB forum inside the members area fully operational. All is going according to plan but not to schedule. Getting the game on the market before Christmas seems to be a objective that is slipping away by the hour, and the Christmas party lat night and my subsequent hang over today didn't accelerate my productivity. Still, every hour I work, and press my hirelings and talented henchmen to work, brings the release an hour closer. Speaking of henchmen, I have a lot of talented people helping me with this project, and The Mutant Epoch could not have gotten to this stage without tons of feedback, play tester advice, family support and sacrifice. There have also been a lot of people online, including some of my illustration client-rpg publishers, who have been very gracious with advice, resource sharing and camaraderie. I'll be thanking them properly in the book credits and on the website. To close off before I settle down to several hours of edit insertions, thanks to all of you who have signed up to the Outland Arts Insider newsletter and TME inform mailing list, this blog and wrote me email asking about the game. Although Outland Arts hasn't started marketing this Post Apocalyptic game, other than a few cryptic tweets, some banners here and there and a teaser ad on roleplayingtips.com, we are still getting a lot of attention and it is a huge motivator toward getting this done as soon as possible, without sacrificing artwork, rules clarity, game balance, grammar, spelling or other RPG book publishing challenges. Sheer force of will can fuel a person to work insane hours, draw upon reserves of enthusiasm, optimism and creativity, summon self discipline beyond anything he or she has known before, and get one very, very close to realizing goals which fall short by only a matter of weeks or months. I’m talking about getting The Mutant Epoch released, of course. It has been a challenge like no other in my creative life, and has been one of those things that sheer force of will has propelled along for over seven years now. The last edits are being interwoven into the Hub Rules book day and night. The coffee flows and I sit alone here night after night getting ever closer to a final, polished, game of extreme post-apocalyptic mayhem and adventure. In fact, I am taking a break from the last edits to update some of the Outland Arts social media venues ahead of next week’s advertising campaign. We have an ad going out in the upcoming issue of roleplayingtips.com so anticipate some traffic from that. The anticipated release date back in late September 2010 was to have the game out late October, and as that month came and went in a blur of activity, art, gaming, and writing of the free material for the web site, we now find ourselves in mid November. 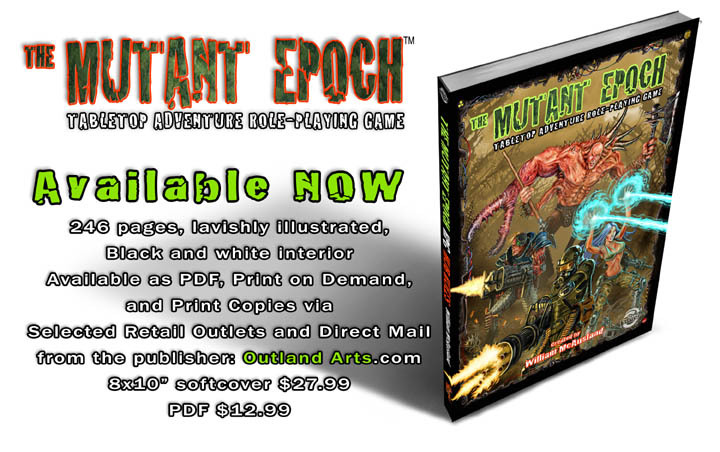 We’ve decided to provide news on the impending release and showcase artwork here on The Mutant Epoch blog to show a little more of what you can expect in the book right up to the release date. Thanks to all of you for the help with getting the word out and the encouragement. Knowing people are out there eagerly anticipating The Mutant Epoch’s release, not to mention the pre-sales I’ve heard about from the local game stores and individuals, has been extra fuel and motivation to see this game done, and done right. In the meantime, here is the new release notification ad. Look for artwork here on the blog over the next weeks as we head down the home stretch. BigCon was a huge success, even though we only had demo copies of The Mutant Epoch tabletop RPG. We've posted to the TME blog with more news and images on the Kamloops based game convention. we had a lot of people wanting to buy copies of the book and told them that mid to late October, this year, next month, we would have copies available for purchase in the local game shops , online and mail order direct from our headquarters. 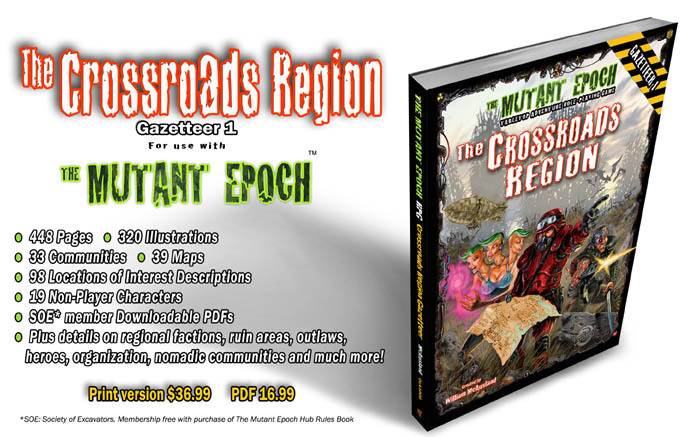 The Mutant Epoch hub rules book will come in at 248 pages, and at a retail price point of about $30.00 us and cdn. Editing, completion of the full page digital grayscale paintings inside , a few art changes and the index still need to be done, after which we will order a decent sized box fro local distribution and mail order, and load the POD And PDF versions to our online retailers. If you want to keep up with the latest news on this project, sign up on our mailing list. 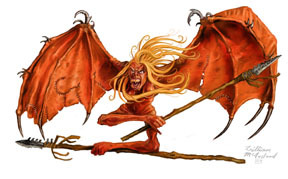 We have been adding a whole new character race to the Mutant Epoch hub rules, on recommendations from a fellow called Brutorz Bill. 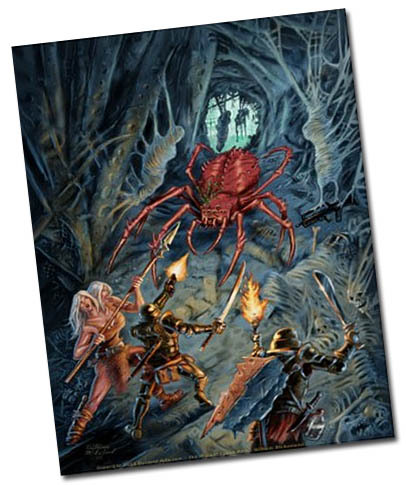 Mutant Animals, called Bestial Humans in TME, were slated for the expansion book along with a heap of other new character types, but after much consideration decided to add them to the Hub Rules book. As explained in our blog, this additional race, along with six new skills, has delayed the release by two months at least but should be worthwhile and I am very excited to see some of these half-animal characters in test play. In other news, the cover for the Mutant Epoch is all but done, as is the cover for our first multi-path adventure called ‘Mall of Doom’ (formerly the Village of Walsave or Mall of Horrors). We will be posting all TME news and updates on The Mutant Epoch main page as well as the blog and our twitter feed.